Designed specifically for transferring and transporting the Bariatric patient. Patient weight capacity up to 1000 lbs. 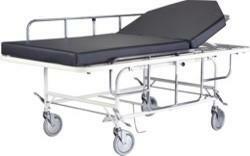 Extra heavy duty reinforced stretcher frame, litter top, fowler back rest and side rails for maximum stability and years of reliable service. The hydraulic fowler back, foot pedal controlled rest is standard. The litter top allows for maximum patient surface and is 40” wide bumper to bumper for doorway access. Litter top height - 39.375"
Litter top length - 80.25"